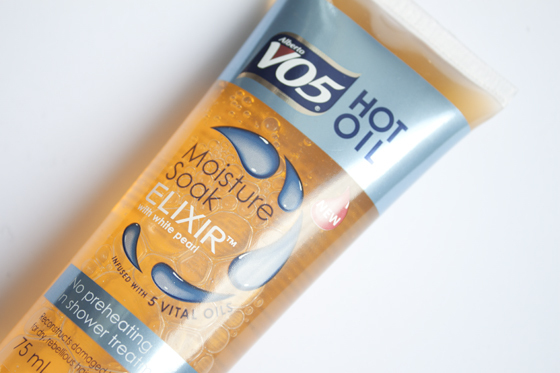 Another hair treatment I've recently added to my weekly hair routine is the VO5 Moisture Soak Elixir. I've used the hot oil tubes on and off for years now so when I saw my flatmate had this in the shower I knew I had to go out and get it. 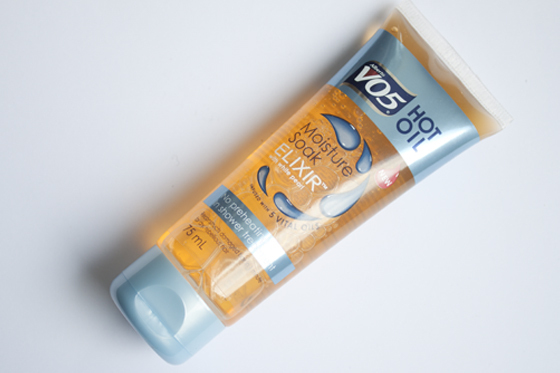 Unlike the VO5 hot oil treatments which require you to heat up the tubes under hot water, the VO5 Moisture Soak Elixir can simply be used as an in shower treatment. I probably use this once a week before I wash my hair while Im in the shower. On the side of the packet there is a little guideline showing you the correct amount to use which is so useful. Although because I have long hair I tend to use about one and a half's worth of the recommended amount of product. I only really apply it to the ends of my hair, working it into the tips which need the most conditioning. I then run it through the rest of my hair and then put all my hair into a bun of top of my head and avoid getting it wet for a minute or so then rinse and wash as normal. The results are pretty instant, as soon as I start to wash out the oil my hair feels soft and healthier and overall a lot more happier than it was before I stepped in the shower. I really really like this hair treatment and I've actually gone ahead and repurchased this already. It's so convenient and cheap and gives instant gratification. I like both this and the traditional heat up tubes, but this cuts the mess and the waiting around for the tubes to heat up. Highly recommended product from me!